Generate and print different types of ID cards such as employee ID cards, visitors ID cards, student ID cards, security staff ID cards and other similar types of id cards for Mac users using ID Cards Maker (Corporate Edition) for Mac. Software provides Gate Pass Mode to design Gate Pass for visitors and maintain visitors records by adding visitor information to the database. 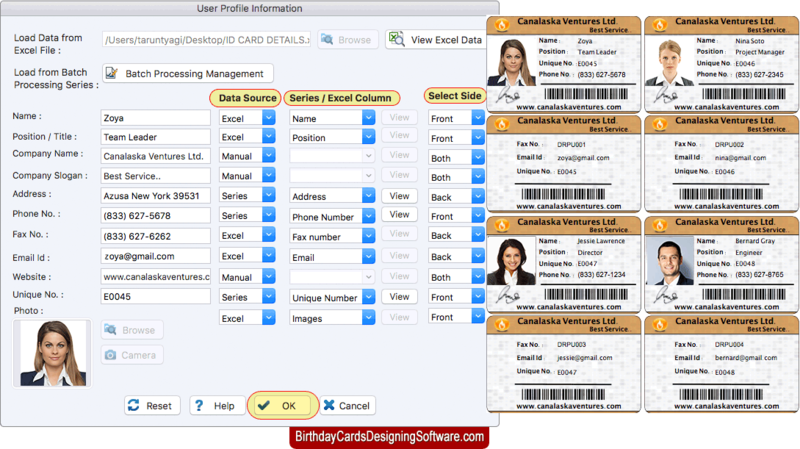 To quickly generate ID cards, software has various pre-defined templates (pre-loaded ID Card Design). Software design multiple ID cards with different barcode value and text using Batch Processing Series option. To add images on your ID cards, you can crop single or multiple images using Image Cropping Tool, if required. You can save your designed id cards as template, as image and as PDF file format. Software is also having option to send designed ID Cards to the specfied e-mail ID. Camera Setting is also available to capture photo of id card user , to add on your id card.